For those of you who liked the convenience of quickly retrieving a document you recently worked on in Windows XP, you can add it back to your Start Menu in Windows 7.
to open the Taskbar and Start Menu Properties dialog box. check box, select it, click OK, and then click OK again. Verify all inventory transactions that were received, produced, sold, or issued have been entered and updated. If you have LIFO or FIFO items, all negative tiers must be cleared before performing the physical count. For more information, see Clear Negative Cost Tiers. Print the Physical Count Worksheet and freeze inventory items. Select Inventory Management Physical Count menu > Physical Count Worksheet. The Physical Count Worksheet window appears. In Physical Count Worksheet, select the report settings, print options, and enter the selection criteria for the items, product lines, and warehouses for which you are performing the physical count. For more information, see Physical Count Worksheet – Fields. At the Report Options field, select Print Worksheet and Freeze Items. Click Print. Count the actual items in stock and record the information on the worksheets. Use Physical Count Entry to enter the actual count from the Physical Count Worksheet. Select Inventory Management Physical Count menu > Physical Count Entry. The Physical Count Entry window appears. In Physical Count Entry, enter the warehouse to enter counts for. For more information, see Physical Count Entry – Fields. On the Header tab, select the appropriate options for sorting the physical count, product and procurement types to print, and enter the selection criteria. On the Lines tab, enter the actual quantities from the physical count. Click Print. The Physical Count Variance Register window appears. In Physical Count Variance Register, select the appropriate options for sorting the register, product and procurement types to print, and enter the selection criteria. For more information, see Physical Count Variance Register – Fields. Click Proceed. Review the results and conduct a recount if necessary. Go to step 5 if no changes need to be made. When prompted to update the Physical Count Variance Register, click Yes. The quantities in inventory match the quantities on the Physical Count Worksheet. In Physical Count Worksheet, enter the selection criteria for the items, product lines, and warehouses for which you are performing the physical count. For more information, see Physical Count Worksheet – Fields. At the Report Options field, select Freeze Items Only, and then click Print. Collect and enter the count information. Count the actual items in stock and record the information on count cards. Select Inventory Management Physical Count menu > Count Card Entry. The Count Card Entry window appears. In Count Card Entry, enter the count card number and item information from each count card. For more information, see Count Card Entry – Fields. Print and review count card information. Select Inventory Management Physical Count menu > Missing Count Card Listing. The Missing Count Card Listing window appears. In Missing Count Card Listing, enter the range of card numbers entered in Count Card Entry, along with any count card number(s) to exclude from the listing. For more information, see Missing Count Card Listing – Fields. Click Print and review the listing to determine if any count cards are missing. Return to Count Card Entry and enter additional information if needed. In Count Card Entry, click the Print button. Select Inventory Management Physical Count menu > Count Card Report. The Count Card Report window appears. In Count Card Report, select the appropriate sorting and printing options and enter the selection criteria. For more information, see Count Card Report – Fields. Click Print. After the report prints, a message dialog box appears asking if you want to print the Count Card Variance Register. Click Yes if you want to print the Register, or click No and proceed to step 4. If you clicked Yes in step f, the Count Card Variance Register window appears. Select the appropriate sorting and printing options and enter the selection criteria. Click Print. A message dialog box appears asking if you want to update the Count Card Entry data to Physical Count Entry. If you need to make adjustments to the count data, either return to Count Card Entry, or proceed and make the adjustments in Physical Count Entry. Click Yes to update Physical Count Entry. Note The records will be cleared from Count Card Entry after they are updated to Physical Count Entry. In Physical Count Entry, on the Lines tab, review the data from Count Card Entry and make adjustments as needed. For more information, see Physical Count Entry – Fields. Click Proceed. Review the results and conduct a recount if necessary. Proceed to step 11 if no changes need to be made. The quantities in inventory match the quantities on the count cards. This error is related to the “DEP” on the WIN 2008 server and you need to disable the DEP from checking the Launcher32.exe file. Turns out that MAS90 or 200 are not compatible with DEP on Version 4.30 and it must be disabled. Otherwise you will receive the force close errors and Exception error like the one below. Here is how you disable it. I must give kudos to Nathan Shaw for the solution. The Average Inventory YTD is calculated based on the Year and Period/Month selected. The data used in the calculation is stored in the IM_PeriodPostingHistory.m4t file. 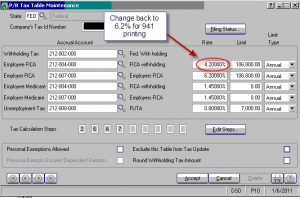 Then, add these Ending Balances together then divide by the number of periods. Note: Inventory is perpetual; therefore the quantity on hand may include future transactions. The Average Inventory is calculated at period end by dividing the running total of the quantity on hand plus the current quantity on hand by the number of periods. The quantity on hand for the prior period is added to the accumulated quantities on hand for all the prior periods for the year. The current period is not included. Note: A=0 (Prior total); B = 50 (0 + 50); C = 1; D = 50. (Avg on Hand Qty in IM2 * Previous Period) + (Current Qty on Hand ) / Current Period. Expand Modules, Accounts Payable, Main, and click Manual Check Entry. In the Bank Code field, enter the bank code associated with the check to reverse. In the Check No. field, enter the check number of the check to reverse. In response to the question, “This check has been voided. Do you want to reuse check number?” click Yes. In response to the question, “Is this a check reversal?” click Yes. In response to the question, “Recall original invoices?” click Yes to reopen the original invoice or click No to leave the original invoices closed. If No is selected, select the GL Distribution check box (version 4.10 and earlier) or from the Lines tab, click the GL Distribution button (version 4.20 or later). On the Lines tab, the invoice amount will be displayed with a negative amount. Click Accept. Print the Manual Check Register and then update. Note: If the check was for G/L distribution only, an invoice will be created and posted to the vendor’s Open Invoice file. The invoice number would be CKxxxx (where xxxx is the check number). To avoid posting an open invoice to the vendor’s Open Invoice file, in response to the question, “Recall Original Invoices?” click No, and select the GL Distribution check box (version 4.10 and earlier), or from the Lines tab, click the GL Distribution button (version 4.20 or later). Manually enter the negative check amount. From the Lines tab, click the GL Distribution button (version 4.20 or later). In response to the message, “J/C Invoices recalled, manual distribution must be completed” click OK.
We have recently have had some of our clients ask how to fax from inside MAS90. Special MAS200: Setup Note with Sage MAS 200, the log on account running the application server service must have access to the fax machine on a network level. If not, the message “Error has occurred during Faxing, please check the default fax setup in Customer Maintenance” occurs when clicking “Send Test Fax” button in Sage MAS 200. 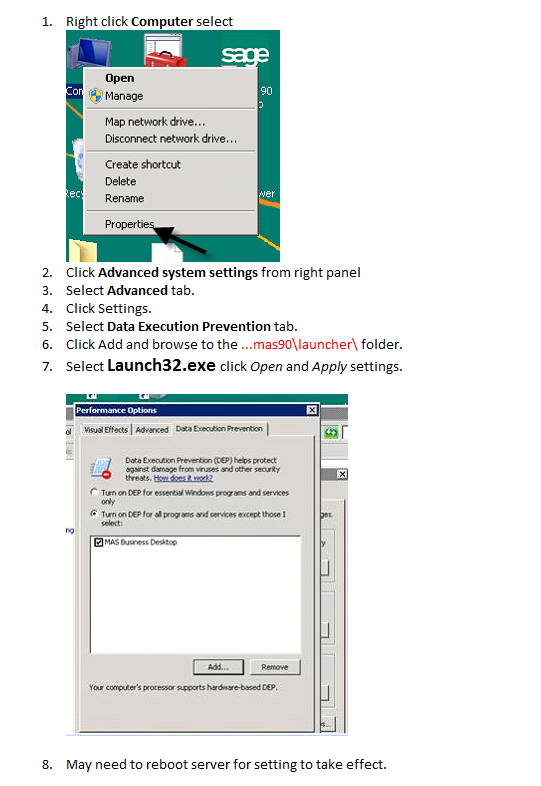 Install Windows fax service on the Sage MAS 200 application server. The modem must be located at the application server. Share the fax with all Sage MAS 200 users, install the fax service on the workstation, and map the workstation to the fax machine on the server. Set up Microsoft fax service on the workstation, and map to the shared fax on the server. Expand Library Master and Main. Double-click Company Maintenance. In the Default Fax Printer list, select the shared fax. In the Fax Cover Page field, browse to the cover letter (.cov format). Click the Send Test Fax button to send a test fax. Complete all fields, and perform the test fax. Verify that the test was successful by confirming the test fax displays in the Outbox folder in Microsoft Fax. Expand Paperless Office and Setup. Double-click Paperless Office Options. In the Enable Electronic Delivery and PDF Storage and Load Data on Initial Viewer Access sections, select all check boxes. Expand Paperless Office and Setup. Double-click Form Maintenance. Select the company, module, and document. Note: We recommend defining a combination of all companies, all modules, all documents initially. In the PDF Directory field, select a valid directory. In the Override Password and Confirm Password fields, enter the password. Expand Accounts Receivable and Main. Double-click Customer Maintenance. Expand Accounts Payable and Main. Double-click Vendor Maintenance. Select the customer or vendor record for faxing. In the Fax field, enter the fax number without dashes or parenthesis (for example, 7145551234). Note: The parenthesis and dashes are automatically added. In the Document list, select the appropriate document (for example, select S/O Invoice in Customer Maintenance). In the PDF Delivery Options section, select the Fax check box. In the Fax Options section, select the options, and then click Accept. Note: Define at least one option besides the Contact Code field. In the transaction window, select the form to fax (for example, Sales Order Invoice), and then click Quick Print. In the Delivery Options list, select the appropriate delivery option (for testing purposes, select Electronically Deliver Only). Select the Fax check box. In the From Fax Number and From Name fields, enter the sender information. If a message is defined in Electronic Delivery Message Maintenance, select the Use Fax Message check box or enter a subject. The OK button is disabled until all required fields are completed. Click OK, and then click Print. Notice the fax previews in .pdf format. Faxing multiple invoices may require closing the preview window to send the next invoice. In the print window, we recommend selecting the Print Invoices already Printed check box (or its equivalent) to ensure the forms fax. Do not use the standard form code (as the Electronic Delivery Options may not save). For those of you interested, here is the last roadmap published by Sage Software during their August 2010 Partner meeting. It details how Sage is handling the FRX retirement and rollout of Sage MAS Intelligence. It discusses the upcoming features and rollout schedule for the new versions of MAS 90 and 200. Additionally it discusses the new MAS200 SQL product that was released during October 2010. Thanks to Wayne Schulz for providing a copy of the Road Map. 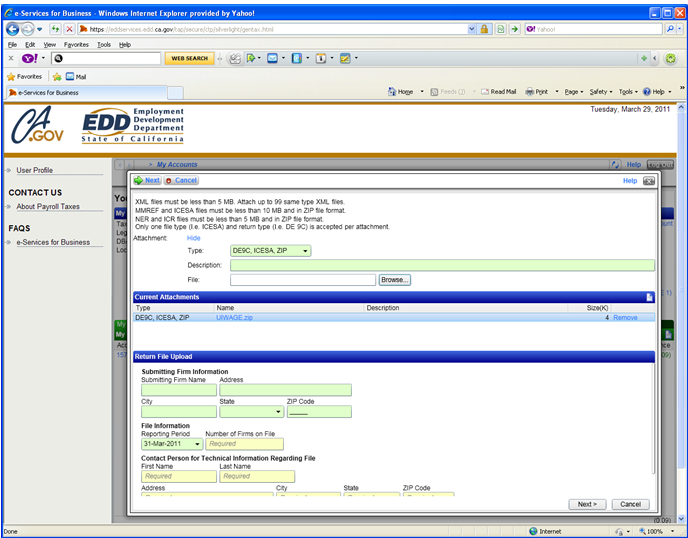 Have you ever wondered about how to automate the process of entering Accounts Receivable invoices into Sage MAS 90 ERP? How about uploading Sales Order data while you sleep at night, ready to process by the time you arrive in the morning? With the Sage MAS 90 Visual Integrator (VI) module, users can automate the import of Accounts Receivable, Sales Order, or other types of data, by running a VI job from the command line. A Visual Integrator job or any other Sage MAS 90 program can run independent of Sage MAS 90, with a Windows task, a batch file, or similar method. This allows a user to run the job after business hours, or several times a day, without anyone having to log in to Sage MAS 90. If an argument has no value (for example: if the User Logon has no password), use quotation marks (“”) to hold the arguments in place. The User Logon above refers to the Sage MAS 90 or Sage MAS 200 ERP user logon setup in User Maintenance (not the User Code field in User Maintenance). Set the Program Argument to Auto or Manual. The Manual option forces the import job interface to launch, and requires the user to click Accept. Use the Manual option to test your procedure, then use the Auto option once you have verified that the job launches correctly in the Manual option. Any program run with a command line on version 4.0 must exist as a Task within the Sage MAS 90 or 200 Role-based security system. You must add Visual Integrator “legacy” jobs (jobs not using a 4.0 Table as the Primary Table) to the Jobs Menu before running the job with a command line. Jobs using a 4.0 Table as the Primary Table are automatically added to the Jobs Menu (for example General Ledger jobs). After you add the task to the system tasks files, use Role Maintenance to grant access to the new menu for the Visual Integrator Jobs menu. The user logon specified on the command line above must belong to a role that has access to this new task or menu item. For Sage MAS 200, the path to the Sage MAS 90 directory used in the shortcut properties corresponds to the Sage MAS 90 directory of the Sage MAS 200 Server Installation, not the Sage MAS 90 directory on the workstation. In the VI job, enter the path to the Import File/Export File as it appears from the WORKSTATION, and uncheck the ‘On Host’ option.